we're kinda new so there isn't much to read over here. 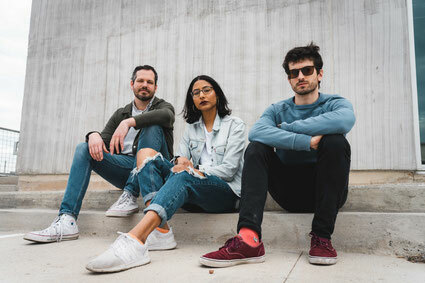 The anticipation was palpable when Low Horizon got together in August 2017 to record the follow up to their internationally acclaimed debut ep, "Four Songs too Long". However, the excitement was short lived. On Friday, August 25, Hurricane Harvey made landfall a couple hundred miles south of Houston; by Sunday morning Low Horizon's studio had taken almost six inches of water. While this was certainly insignificant compared to the unforgiving and indifferent devastation that disrupted the lives of thousands throughout the city, it put an indefinite pause on the recording process. Written between July 2016 and 17, Low Horizon's forthcoming debut album "Eternal Depressed Summer" is about wasted potential, focusing on themes of isolation, hopelessness, and doubt. The album is influenced by the great neglected American ideals: late nights drinking alone; the misguided notion that success is making people more money than they pay you in exchange for health insurance; facebook friends with questionable politics. Low Horizon was technically formed in 2010 as a distraction between three lifelong friends (Jack, John, & Travis) from long school holidays, but didn’t really get serious until two of the members traded their instruments for stethoscopes on their way to med school in late 2015. With the blessing of the retired members, John built a home studio in his childhood bedroom and re-recorded the band’s best songs as well as three new ones. He spent his spring nights and summer weekends tracking and mixing the album and brought it up to NYC for mastering. About a month before mastering, John played the mix to Dao during a lake house excursion. Dao joined the band that weekend, offering to play bass even though he barely played the instrument and didn’t own one. John let him borrow Travis’s old bass; it was truly a somewhat symbolic moment. Dao quickly learned the bass parts and thanked John for not making them boring. Jasmine got her start in music at 12-years-old on the clarinet. She went on to study professionally at the University of Houston under the guidance of Randall Griffin, principal clarinetist of the Houston Ballet. During her studies, she became the principal player of the UH Wind Ensemble, orchestra, and Aura Contemporary Ensemble, premiered a ballet at the World Association for Symphonic Bands and Ensembles Convention as principal player, and played for Martin Frost. After graduation, she decided it was time for something cooler. She took up drums in late 2016, joined Low Horizon shortly after, and has been teaching herself ever since. The band has been busy ever since; releasing tunes, recording music videos, and of course playing shows.